Discussion in 'Maintenance, Tinkering & Embellishment' started by Gary W. Graley, Oct 28, 2018. 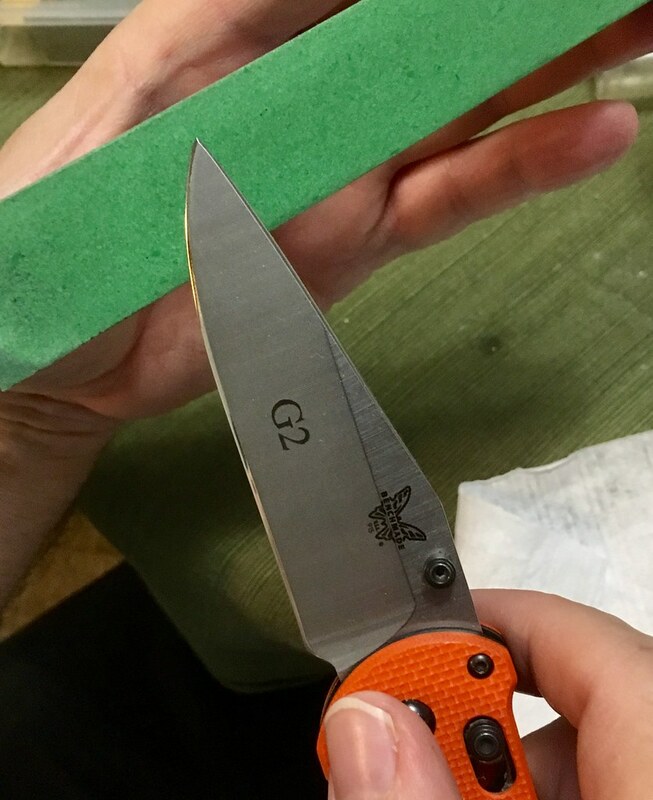 Hi folks, I have a new Edgepro 220 grit stone, white, although it quickly took a discoloration that is deep into the stone, but initially the stone also would not cut/sharpen at all, blades would just skate across it, I contacted Edgepro and he was very quick to reply, even on a weekend! He gave me some instructions as to help get the stone cutting again as sometimes after they have been cut down they can have a hard glaze, but I explained that I am a bit unorthodox using these stones as I free hand sharpen and do not own the Edgepro setup any longer, just some of the stones remain that I hold in my left hand pinched between my thumb and ring finger and the knife in my right hand. But I agreed it felt like it was glazed over, I tried to return the stone to the big river store that sold it but they didn't want to take it back, time had elapsed, my bad as I was hoping that it would work in, it didn't. So tonight after his email, I took some fine carbide grit and began to resurface the face of the stone, grit on a plate glass, some water and some elbow grease rubbing the stone around over the grit. Now the stone will cut, I have never see a stone soak up as much water, did so even before trying to do the surface treatment, and while it cuts, it still isn't the same as my old and totally different color Edgepro 220 stone as you see in these images, it is like a dark pink or light purple color. Have any of you run into this with the Edgepro stones? Anyone have one that is the color of my older one? 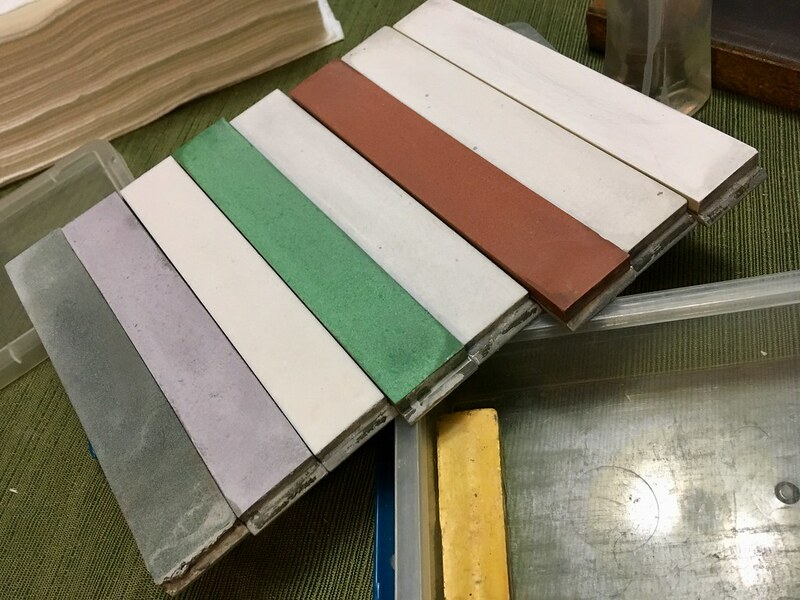 The new 220 grit is in the middle, even after resurfacing you can see the staining is deep into the stone, the foremost stone is a 320 grit from Edgepro and the back stone is my old 220 grit from Edgepro, note the color of that one, that cuts very well, but has dished out quite a bit. I sent these photos on to Edgepro tonight and will see what they say tomorrow and report back. J D Wijbenga likes this. I have an old white one (and a really old brown one)... but I'm guessing you're wanting to know if someone bought one more recent, and what it looks like? EP does tweak their formula from time to time... though your new one almost looks like something was spilled on it. (Maybe something got in the mix). Gary W. Graley likes this. It was almost like some metal got down inside and rusted causing a stain, but it was a strange stone right from the start, not biting in at all, the other stones all work great, just that one. I had hoped it would be the same color as the previous one as that cuts nicely. Thanks for the post though! Who responded to your email? I think Cody would be the one to ask about this issue. Is your glass plate dished from use? I only ask because I have seen this problem with the Matrix stones when EPs glass plate was too worn in the middle. The ends and sides get dressed but not the middle. It was Ben that responded, quickly I might add which is a good trait of customer service right there ! 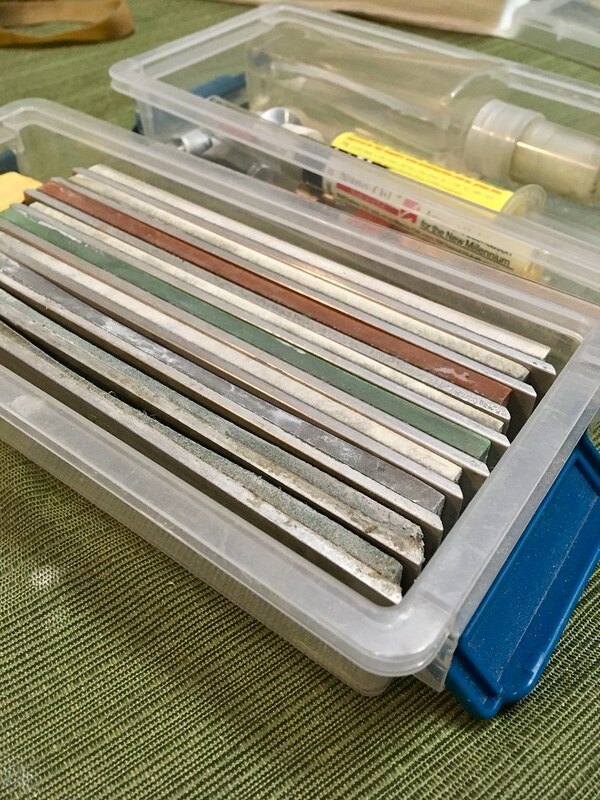 And his assessment also indicates that my old 220 grit stone probably is not an Edgepro brand, but one I picked up from chefsknivestogo site years ago, so that solved that mystery as to why they are so different. The glass plate does show wear but not so much as to not level the stones well, Ben was asking if the carbide grit had any oil on them but they are quite dry, so it is strange to see the staining this stone has taken, after the grit was used on it, the surface is now broken so it does cut, but I think I will just take it to work to put with my 'at work set' that I keep there to help out folks when they have a dull blade. If it's not a EP stone, and is pink... it's maybe a Ruby Stone you can get at Congress Tools? The dished one looks like my Shatpon Glass 220 for Edge Pro which always does a great job for me. From day one it was aggressive enough. (I did buy a 120 for reprofiling). I condition mine on a DMT 220. Not ideal but works well. Yeah . . . I don't know about those original Edge Pro stones. Except that they are real proud of them ( ^^$). That must be what it is, even dished it works well as I still use it, but then, I free hand sharpen so it's not quite the same as using it inside the edgepro setup. Ben reached out to me today and said I could send my 220 in to him if I want and I'll do that just to make sure it is cutting as it should and is not something that is wrong with it. I'll report back on that when I get the word from him, all in all, they respond quickly and are willing to help, a very good trait in customer service ! Yes Edge Pro is a good out fit. Way to go Ben !
. . . er . . . hey Gary . . . you ought to have 'em send you another Edge Pro while they are at it. Sounds like you have forgotten what kind of edges that thing can produce. I touch up as you do but can not imagine going without a sharpening jig for the real sharpening. I've held off getting any systems, had a lot of them over the years but keep going back to free hand sharpening. 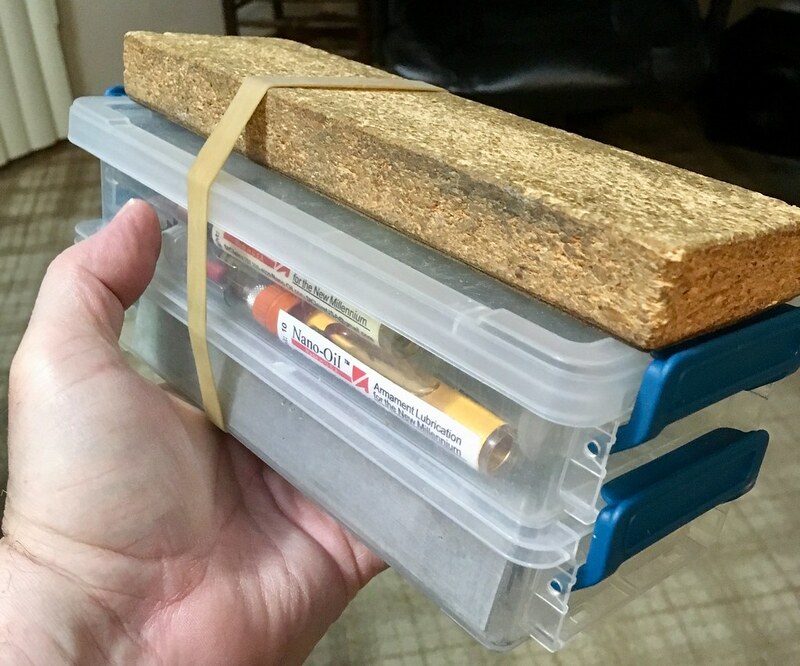 I keep the edgepro stones in a nice little compact box, two tier snaps together with the strop rubber banded on top, the top box has odds and ends as well as a spray bottle of water, all self contained. Most times on touch ups I'll go from 400, 800 and then 2k and 8k depending on how toothy I want the edge to be. J D Wijbenga and willc like this. I need to remember I can store mine that way (up on edge). I lay mine flat side by side on top of my little hunks of Norton water stones. Hey . . . that made me wonder. Is there any chance the stone that discolored took on some aluminum from the back plate of stones it was against ? ? ? ? PS: do you find it scary going from the deeply cupped stones to the flat stones ? Tha's a no no in woodworking edge tools. Cliff Stamp frowns on it too; even for hand sharpening while holding the stone in hand. I keep meaning to do some tests of my own using cupped stones (hand held of course) on pocket knives to see what the real problem is, if any. Yes . . . I and Stamp are thinking : Much wider stones. So, mostly to satisfy my curiosity, where do they get a pink Shapton GlassStone? All the ones I've seen are white.... there a different "model" out there? On my screen it looks toward very light purple. Here is one image of a few I found of . . . what we could call . . . an off white Shapton Glass. Note the white background. 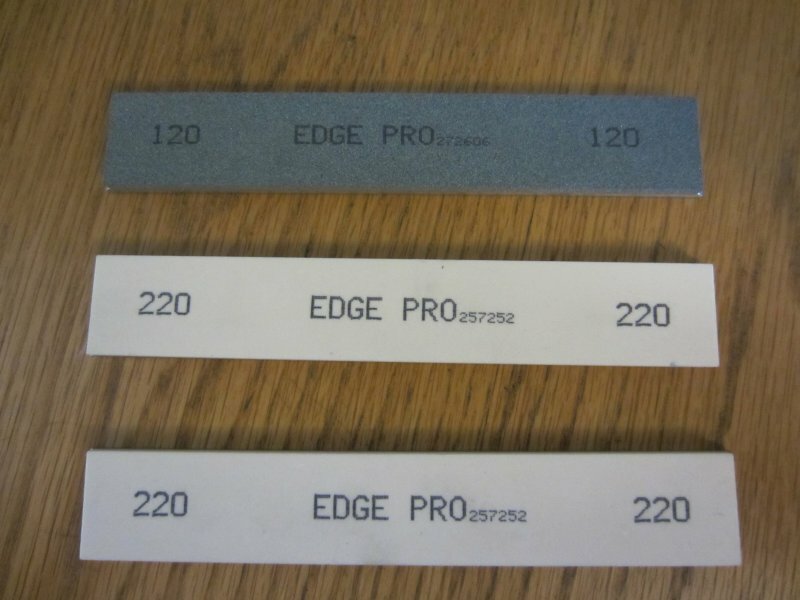 Just as a reference my Edge Pro 220's looks like below. Picture is from 2016 and they are a couple of years older than that. Both 220's have the same color, the difference is lighting playing tricks, under good lightening they both look like the one in the middle. I'm all for 220 grit. Makes life so much simpler and faster when it comes to getting a dull knife sharp. First thing I did after I tried my Edge Pro with the 500 Shapton Glass it came with was order the 220. So the stones in your photo above are Shapton Glass or are not ? PS: I wish they would mark the aluminum plate with the "220" rather than the stones I have to write the grit size with marker on the aluminum then it gets worn off.